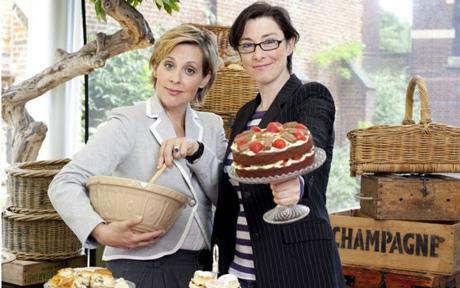 We had a veritable cornucopia of baking talent on this years series of GBBO. Each had their strengths and weaknesses. But now we are down to the final 3! Personally I think all three are fantastic but for very different reasons. My head is a Holly fan, she is a perfectionist and (almost) all of her bakes have been pretty perfect. I asked Holly which bakes were her favourite of the series to which she answered her Cheese and Onion pie and the battenburg technical bake. Looking back I would have to agree that those were two of her best weeks and that pie looked amazing! My heart is a Jo fan through and through, how can you not fall a little bit in love with this lady! She is sweet and self deprecating, but a bloody good baker to boot! Her personal favourite bake was the Danish pastries in week 10 as she had never made them before and was happy to learn something new. She had her fair share of bad weeks, her croque-em-bouche was a little "leaning tower of pastry" and her brandy snaps lacked the necessary snaps. However, when she is good she is brilliant! I mean those pastries did look absolutely delicious! My tummy however is head over heels in love with Mary-Anne! Her food is hearty and adventurous. Her flavours are always risky but inevitably delicious, plus she is hilarious! I just love her attitude to food and baking, she comes across so relaxed and un-phased even when the worst happens. Mary-Anne's favourite bakes were her melting moments, and the show-stoppers in the final (can't wait!). She doesn't think either could of been any better! So my body is pretty much supporting all three at this point, I couldn't possibly say who I want to win! I am firmly sat on the fence on this one. Although if you asked me who's cook book I would buy, the answer would have to be Mary-Anne. I can just imagine her writing being funny yet informative and her recipes being totally original! If her food writing style if anything like her twitter feed I would read from cover to cover! I am contemplating a small party to celebrate, complete with mountain of baked goods inspired by all of the contestants. What was your favourite bake? Have you tried any of the recipes? Are you having your own Bake-off party? And most importantly who would you like to see win? The final will air next Tuesday (4th) at 8pm on BBC2. I think Rob *swoons* needs a mention! His timings (and hair) made for great television. Definitely want Mary Ann to win. I bet her food always tastes amazing, no matter what. His floppy haired good looks and cheeky smile got him through some shocking weeks! They all have great qualities, and while I accept that one will ultimately win, I strongly believe they are all winners. Nice round up. No Rob wouldn't have been my choice either, timing is all in baking. I'm as torn as you are, Jo, Holly, Mary Ann I don't know - oh well at least we know that as long as they get to the final they are unlikely to disappear from the foodie world. Ah Rob and his floppy hair and beautiful eyes - VERY distracting, but his baking drove me insane. All three finalists so deserve to be there. I'm torn too, as I'd be happy to see all of them win. Perhaps Mary-Ann slightly pips them as I too would love to read her cookbook - her inventiveness is inspiring and I'm a stage now with my own baking where inventiveness would be good. I'm with Nelly, I was never a Rob fan. He was given way more chances than other, equally as good, contestants. A Bake Off party, what a fantastic idea! Why didn't I think of that! Never a Rob fan either! His lack of preparation and respect for others who had slavishly practised must have driven the other competitors mad. My gut instinct is going with Mary-Ann although I'm going to be contraversial and say perhaps she wasn't exactly the 'look' the programme makers were looking for in a winner. It is a TV programme after all. All I do know is that my Tuesdays won't be the same again - Have LOVED this series. Well after the final there are 3 more episodes, a master class from both Paul and Mary, then a "where are they now" episode about last years contestants.